What better way to review a restaurant than with good friends. We were looking for a place in Williamsburg, Virginia, to meet our friends, Ginger and Miller. We wanted a relaxed environment with good food. Last year, we discovered “Food For Thought,” which we suggested. Ginger agreed that it would be a great place to meet—she and her husband live not far from Williamsburg and come here occasionally throughout the year. 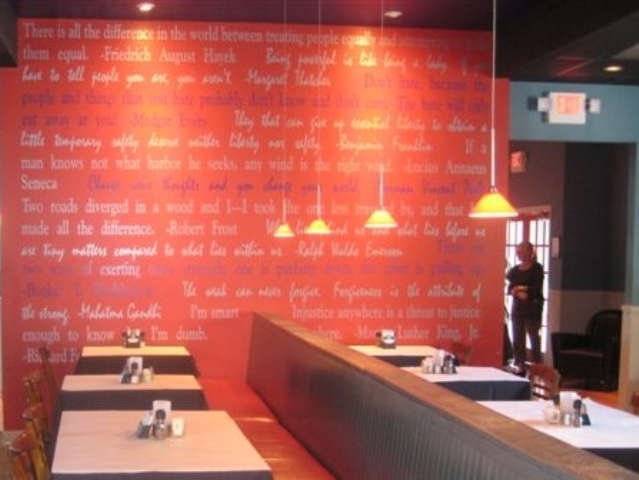 With that in mind, the restaurant is tastefully decorated with portraits of the world’s great thinkers and authors, with quotes from these authors inscribed in easily read print on the walls. For the conscious diner, the Food For Thought experience can both satisfy the taste buds and stimulate the intellect. To further promote the intellectual exercise while dining, discussion cards—e.g., question cards such as those found in Trivial Pursuit®—are placed on the tables to help stimulate thought-charged conversation. Catching up on the news of the last year, and reminiscing about events half a century ago, however would provide us with plenty of intellectual stimulation and fodder for conversation. Even though we arrived a few minutes early, Ginger and Miller were already seated and the hostess quickly made the connection and guided us to our table. Our server, Tara, arrived promptly to take our drink orders and explain the specials for the day. One especially tempting item for a “starter” was the crab chowder. As will happen with friends who have not seen each other in a while, we immediately broke into conversation, catching up on events of the last year, neglecting our menus. Our beverages arrived and Tara was ready to take our food orders. We found ourselves scrambling to scan our menus. First, we agreed on a cup of the chowder. Reading the menu is an adventure in hunting through an assortment of tempting offerings such as Hickory Salmon (“encrusted with hickory and molasses seasonings and baked to perfection,” or the Quinoa & Lentil Burger (“our protein packed organic quinoa and lentil patty on a toasted brioche roll with lettuce, tomato, avocado vegan mayo and a side of skinny fries”). Most meals include a choice of two side dishes and the menu offers a good selection of side dishes. Food For Thought is a one-of-a-kind restaurant, located in Williamsburg, Virginia. Food For Thought offerings also include an impressive selection of culinary twists on familiar dishes including “Fork Tender Pot Roast” (“our pot roast is slow cooked for hours and hours until it falls apart with a fork. Smothered in our homemade gravy”) or “Grandma’s Meatloaf (“juicy, flavorful, topped with a choice of brown gravy or tomato sauce).” As they say in the South, Ginger “allowed as how” the pot roast was the best she ever tasted (and she comes from a line of accomplished country cooks). Convinced, Peggy followed her lead with the pot roast. For side dishes, we ordered the asparagus and sweet potato fries. Miller selected the traditional Cobb salad, which would prove to be more than he could consume in one sitting. Although tempted by the “Light and Heavy Crabcake” (“a light and fluffy mix of fresh herbs and Japanese bread crumbs surrounding heavy lumps of sweet crab meat”), I opted for Grandma’s Meatloaf also accompanied by the asparagus and sweet potato fries. Once our orders were in, the conversation continued in earnest. Then the chowder arrived…and we fell silent. The chowder was rich, creamy, and full of potato chunks and crab flavor, topped with a splash of sherry. Soon afterward, our meals were served, and the silence continued except for an occasional, “This is really good.” The pot roast was absolutely the best—tender, flavorful—accompanied by perfectly prepared asparagus and sweet potato fries. Similarly, the meatloaf, smothered in brown gravy, was excellent. Steadily, the plates were emptied of their fare, or “doggy bags” were requested to save the coveted leftovers. Thoroughly sated, we passed on dessert, but the conversation resumed and continued for quite a while. The portraits of influential thinkers and their thought-provoking quotes on the walls set the tone for an enjoyable dining experience. The menu is as diverse as the great thinkers themselves, ranging from classic American dishes to more ethnic dishes to healthier vegetarian options to one of their seafood specialties. Since opening in 2006, Food For Thought has received numerous local awards as well as having been recommended as one of National Geographic’s 10 Best Places for Families. Entrées on the lunch menu run from $8.00 to $13.00. Allowing yourselves to indulge in your first choices, a couple should be able to have the entrées and sides (included with meal) of your choice, and an appetizer and beverage for less than $40.00. They do not take reservations, but you can call to make Priority Seating arrangements that put you ahead of walk-in guests on the wait list by calling (757) 645-4665. This is the first of several articles from our trip to Williamsburg, Virginia. One of our objectives was to have dinner with long-time friends at a restaurant we discovered on our last trip here. Food for Thought was the perfect setting combining a convivial atmosphere, a venue for comfortable conversation, all surrounding an excellent meal. 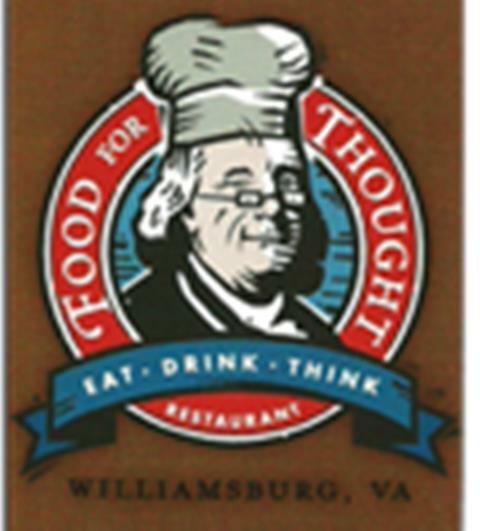 Food For Thought describes a dining unique experience in Williamsburg, Virginia. This entry was posted in Renaissance Bucket List and tagged Food For Thought, intellectuals, meatloaf, philosophers, pot roast, restaurants, Va, Virginia, Williamsburg. Bookmark the permalink.